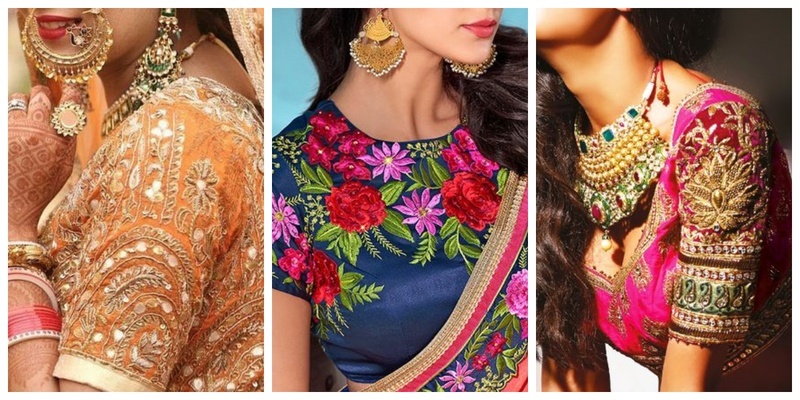 10 blouse embroidery designs to check out this wedding season! Blouse embroidery designs have various styles and types, but choosing a single one to wear with your saree is something that’s quite a task. To make it a tad easier for you to pick the perfect one, I have curated a bunch of blouse embroidery designs photos in 10 different styles for major blouse design inspiration! If you are looking for blouse embroidery designs that have 3D patterns, then these blouses will give you some idea on the kind of embroidery you can get done on your blouse. Such blouse neck embroidery designs look amazing on net sarees or lehengas, where the entire blouse design is on display. Brasso embroidery is done with an acid itch process which involves burning of the fabric to create a textured design. Brasso work blouse embroidery designs usually have geometric and floral patterns and this blouse embroidery design is trending big time this wedding season. Cutwork blouse embroidery designs are basically those where beautiful patterns are created by cutting areas of fabric in a design. These blouse embroidery designs can be done on the yoke, back neck or even on the sleeves and these blouses can be worn with anything including silk and chiffon sarees! Gota Patti embroidery has seen a huge spike in wedding wear outfits due to its sparkle and enchanting beauty. While gota patti is more common with lehenga designs, it can also be done on blouse embroidery designs to wear with sarees! Lace blouse embroidery designs are delicate and have a hint of elegance to them. Use these blouse embroidery designs photos as an inspiration to design your next lace blouse to wear with your favourite saree. Thread work blouse embroidery designs are versatile. They range from machine embroidery to delicate hand embroidery and can be literally worn with all types of sarees or lehengas. Right from simple embroidery designs for blouse to complex and intricate embroidery, you can make a design that’s modern or even traditional as per your style. Maggam blouse embroidery designs are a rage in the bridal world. Maggam embroidery is done using zari that helps give it a festive and heavy look! Maggam work blouses are hands down one of the best blouse embroidery designs 2018. Mirror work blouses have been in trend since time immemorial. Mirror embroidery is widely used in traditional as well as contemporary blouse patterns. You too can choose this blouse embroidery design to wear with net or sheer sarees. Pearl and gemstone blouse embroidery designs are the new kids on the wedding block. A lot of brides have started to opt for pearl embroidery blouse back neck designs to wear with their net of chiffon sarees! Zardosi is timeless. This luxurious style of embroidery is perfect for wedding trousseaus. Make a zardosi blouse embroidery design to wear with you silk saree and wait for the compliments to pour in! Did any of these blouse embroidery designs photos catch you fancy and wanted you to save them immediately?